AND NO, YOU DON'T HAVE TO STUDY GRAMMAR BOOKS. Up to 22, Portuguese was the only language I spoke. Then, I needed to learn English quickly to work with some foreigners who didn't speak any Portuguese. At first, I thought I didn't have a method, resources or even the time available to study. After struggling for some time, I found a way to reach the conversational level in 90 days. We would get up at 5.30am every day and take turns reading aloud in English. Every day I understood more and more the language spoken by a native. Soon, I was expressing myself in broken English. Then, I started using English in real life situations. And finally, this passion for languages became my lifetime career. That small step - taken more than 20 years ago - has changed my life ever since. It has opened more doors for me than I could even imagine. 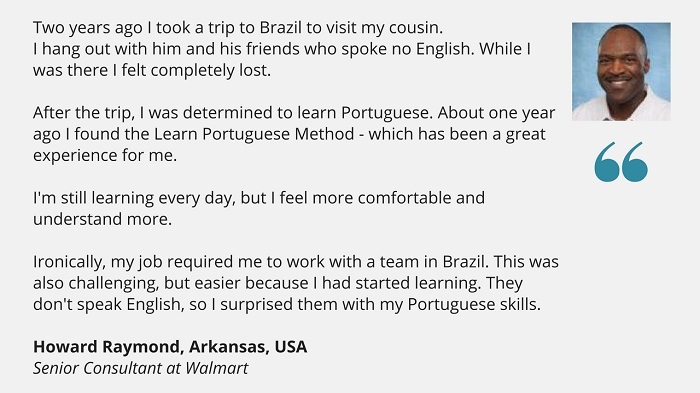 That's why I've been applying this method to help people learn Portuguese online. "Why does this method work time after time"
Because it helps you focus on one thing at a time! And now you can have a similar experience. 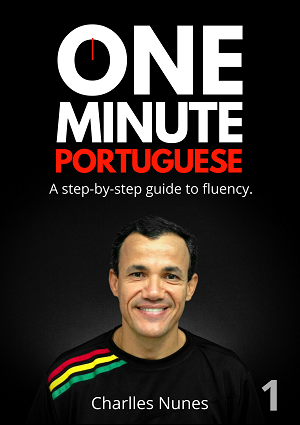 With One Minute Portuguese you will have a step-by-step guide to fluency. You listen to a Brazilian native speaker. You express your first ideas in a broken Portuguese - which is 100% ok for a while. You apply your new skills to real-life situations. - Federico Fellini, Italian film director and screenwriter. Each of them has its own meaning, right? Though each one represents a concrete concept, they don't express complete ideas. When you put them in phrases, things change for better. Got it? Learning simple phrases enables you to express basic ideas. Those are all possible side effects of learning Portuguese! When I started learning English, how could I imagine all the opportunities it would bring to me? I'vve met wonderful people, from blue-collar workers to CEOs to religious icons. I've worked at great events, like the PanAmerican Games Rio 2007 and the Steam Generators Replacement Project in Angra 1. I've created a business online and my family works with me running a language school in Brazil. How would you feel if you could meet Brazilians and talk to them in their own language? Would you like to have that sense of accomplishment? LEARNING A LANGUAGE ON YOUR OWN IS HARD. REALLY HARD. Despite all these benefits I wouldn’t want you to get the wrong idea and think learning Portuguese is easy. Nothing could be further from the truth. But what easy things are actually worth doing? If you take the task of learning Portuguese and keep taking small, consistent steps every day it becomes attainable. When I started learning English my challenge was that I had no plan to follow. After building up a system to follow, I learned Spanish in a fraction of the time I needed to learn English. I've written some books on language learning, and most of them I give away for free. If learning Portuguese may feel like a giant tast, start learning just 15 phrases a day and you can achieve your goal in about three months. Slow and consistent progress is the key to achieving a long term goal. Make a commitment to watch a one-minute video every day - without skipping a day - and you will see success much sooner than you expect! "BUT I'M NOT A FAST LEARNER." What if I told you that you don't need to be? You can watch each minute video as many times as you want. All you have to do is understand the phrases. You can listen to the audio on the car, or in your kitchen. You can even listen to the audio without paying attention! The point is, you need to be surrounded by the language in small chuncks. First, you listen to something you understand. Then, you will become able to use it to communicate. Plenty of people have learned a second language in our Web sites. I'm not a polyglot. I just pick up the language that I believe will be usefull in my life and go for it. That's how I learned English. And that's how I learned Spanish. Chances are you will learn Portuguese faster when you have a reason to learn it! FOLLOW A PROVEN PLAN... AND GET SIMILAR RESULTS! Some people may say, "sure, this works for you, but..."
I've seen lots of cases in which students don't follow any plan. They try to learn by watching YouTube videos and obviously their progress is too slow. On the other hand, it is crystal clear when a student is following a plan. They are excited about learning. They practice every day. They get great results. So, please consider wether you are willing to follow a plan - before you purchase One Minute Portuguese. The Program can't work - and won't work - on its own. It is just a means for YOU to accomplish your goals. To get real results, just follow the plan. LEARN FROM SCRATCH. ONE STEP AT A TIME. Learning a language takes time. It's especially difficult when you don't know where to start. I designed One Minute Portuguese to help you focus on ONE VERB at a time. In just a minute you will learn 15 phrases with each verb. Then you will have plenty of time to PRACTICE before moving to the next one. You will practice your Portuguese with a Brazilian who is learning English. With the right attitude, a clear reason and a solid plan, you can speak Portuguese at the comfort of your home. Interested? Hey, I’m Charlles Nunes, a passionate teacher and author. In 2015 I created two courses: One Minute English and One Minute Portuguese. After getting results with our students at our language school here in Brazil, I decided to offer this course online too. I want to help you learn Portuguese the easiest and fastest way. I live in Angra dos Reis, Rio. I hope you may join our language program, so we may work together to make your language dreams come true! Get my personal follow up on 7 coach sessions. 90 video lessons - one minute each - covering 1.350 Portuguese phrases. 6 eBooks with 15 lessons each. Access to Charlles Nunes School, a modern learning platform where you can follow up your progress. 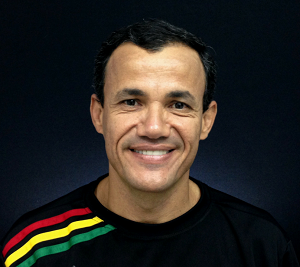 7 coach sesssions with Charlles Nunes, the author of One Minute Portuguese. Get my personal, one-on-one review of your study plan for each level you complete. Lacking the discipline to follow the step-by-step plan. Trying to learn everything at once and getting frustrated for information overload. Fearing the real contact with Portuguese speakers and wasting time in endless preparation. These small mistakes can be very costly. When you can use a language for real communication, you get a feeling of self-actualization. I want to see you at the top of that pyramid! Everything you need to become a Portuguese speaker.